The following is a letter from the Black Student Forum (BSF) to Boston College’s senior administration. The BSF has alternately published the letter as a petition. In your Presidential message, you state that your answer to society’s call, “emanates from a world that has experienced an explosion of knowledge, but not a corresponding growth in understanding; a world that lacks trust in its leaders and faith in its institutions. It is a world that has developed wondrous technologies that link continents, but isolate humans, leaving many men and women weary and dispirited, feeling distant from moral purpose, uncertain about knowledge or the very worth of human endeavor” (Boston College News & Public Affairs, 2014). We believe that Boston College still has not yet lived up to this statement. Many of the women and men here are weary and dispirited due to these events that have risen around the nation, and our own home has turned a blind eye to them. We are expressing our voices directly to the Boston College administration, because we want more from BC. We are experiencing a failing system, one that does not seem to be aware of the lives and minds of its own black students. We are struggling to trust our own institution and its motto, “For Here All Are One.” We feel distant from the school’s claim to a Jesuit moral purpose and are disheartened. Our chants of “Black Lives Matter” across this campus and city demand acknowledgement that at Boston College, too, our lives matter. We are often reminded of our duty as students of Boston College to reflect the Jesuit motto of “men and women for others.” The Pocket Guide to Jesuit Education states, “It is not enough to live authentically in the world. We have to participate in the transformation of the world.” For more than four hundred years, it has been said that Jesuit education educates ‘the whole person.’ A person cannot be considered ‘whole’ without an ability to stand in solidarity with other human beings in their hopes and fears, and especially in their time of needs. We must not only wear the title of “men and women for others”, we must also be active in it. Because you have not taken the opportunity to speak about race, not “diversity,” you do not permit or encourage administrators, faculty and students to enter into this nationwide discussion. It seems as if the Boston College “bubble” has proven impenetrable to national dialogue, expressions of outrages, and testimonies about race. In the letter from the Vice President of Student Affairs, we do not see sincerity. We see a warning against raising our voices, which is not only a right but also a value you encourage in the mission statement of Boston College. We ask for your response to be educational, empathetic, and understanding of what is taking place and how these events have an impact our lives, dreams, and hopes. We believe this resounding silence reflects a greater institutional disconnect between Boston College and the need for discussions about race on campus. Specifically, the one uniting experience of the student body is the Core Curriculum. It is stated on the Boston College website, that “at the heart of liberal education are questions that have relevance in all time and places and that the search for responses to these questions can dispel ignorance and promote genuine freedom.” In addition, it reasons that, “The Core Curriculum should address issues of Cultural Diversity and consider topics that have not customarily been incorporated into the traditional debate about the perennial issues, topics that gain in importance when the Western tradition is viewed from the perspectives of non-European people and of minorities within European and American societies … These topics can supplement and expand the traditional debate about the perennial questions, and can respond to the urgency that many students and faculty feel about the centrality of these issues in contemporary society.” We want to hold Boston College accountable to this statement. If these are the goals of the Core Curriculum, then there is no reason why our history, Black and African diasporic history cannot also be intersected with classes on philosophy, theology, art, history, etc. Yet at the present moment we cannot major in African and African Diaspora Studies. These courses are only available as electives, and many students do not have room to take electives, much less even minor in African and African Diaspora Studies. In our non-African and African Diaspora Studies, our professors do not incorporate Black history or issues or create a space for students to discuss, learn, and foster an appreciation of our heritage. Our academic requirements do not reflect our personal history, or current events. When we receive our Boston College degree, therefore, it is with the knowledge that we were not incorporated into curriculum. This is bias by omission. We first and foremost request a letter to the entire Boston College community acknowledging the events that are taking place in this nation and a way that as a campus, we move forward. We need an acknowledgment of our feelings, a willingness to support the greater discussion on race in America, and personal experiences of race at Boston College. We have seen the correspondences from other presidents at Jesuit Universities, including Georgetown University, St. Louis University, and Loyola University Maryland. In the Boston area itself, Simmons College and Harvard University have addressed their student bodies with heartfelt messages. In continuation of the conversation you have the power to fuel, we demand that African and African Diaspora Studies becomes a major and more fully integrated in the Core Curriculum. Discussions about race and the creation of a space for students to share their experiences and ideas can only reflect Boston College’s academic and Jesuit mission. We want faculty and administrators who have proven capable of addressing and explaining racial controversies, intersectionality, privilege and diversity. This is best achieved with the presence of more national and international faculty and administration of color. We continuously notice that most of the people of color we see throughout the day are facilities or dining staff. The kind of dialogue, mentorship, and intellectual opportunities faculty of color provide is invaluable. Their ability to advise and advocate for us from a position of institutional power is crucial. Although we are targeting African and African Diaspora Studies Program, it is also invaluable for us to see faculty of color in the schools of management, education, and nursing. We need to see the presence of these faculty where students of color are underrepresented, specifically, but not limited to, the natural sciences department. Boston College needs to provide comprehensive diversity training in all areas of the student experience, especially, but not limited to, the Office of First Year Experience and the Admissions Department. We strive for all campus leaders to be competent on issues of race. If the student leaders who represent the Boston College mission publicly, daily, and voluntarily are empowered in this process and knowledgeable about campus resources that facilitate a progressive community, our dialogue will be more productive, inclusive, and transformative. African Hispanic Asian Native American (AHANA) students need to be better welcomed to the Boston College AHANA community and connected with current AHANA students in programs other than the single Keith A. Francis AHANA Weekend. Your mission of diversity should also include diversity of dialogue. If students of color are the ones promoting conversations on race, then we should be encouraging their enrollment and welcoming the testimony of their experiences. There should be more diversity in study abroad opportunities. Boston College students have proven their passion for studying abroad and the often life changing effect it has on their perspective. As long as traditional locations, such as European cities, are more accessible, financially supported and even count for core classes, there will continue to be little diversity in the experiences of Boston College students abroad and the dialogue that they can ignite on campus. Finally, Boston College should makes its academic environment more favorable to students of color who have proven academically worthy and credible. One way is by sufficiently supporting their academic transition, the second is by better advertising academic and leadership opportunities for students of color. Exemplary programs that incorporate, encourage, and continue such goals are Options through Education, the College Transition Program, and the McNair Scholars program. To reference your message once again, “Boston College endeavors to educate a new generation of leaders—men and women who will be capable of shaping the future with vision, justice and charity—with a sense of calling, with concern for all the human family” (Boston College News & Public Affairs, 2014). We are the future leaders who are capable and desirous of shaping society with dialogue and action based on the principles of social justice, and we will begin with Boston College. These demands aim for institutional and communal commitment to the wellbeing of Black/African/African American students at Boston College. We have presented stunning, undeniable statistical proof of continuous dissatisfaction in Boston College Climate studies. We have raised our voices in testimonies, demonstrations, panels, and dialogue. We are frustrated that we need to prove that our experiences are a problem and controversy worth acknowledging and changing. We need you as a president, as an ally, and most importantly, as a Jesuit, to stand with us. Yes because hiring somebody because they’re black is a great idea but hiring somebody because they’re a devout Catholic is most likely anathema to you. To be honest if you want a school that gives money for people to embrace perverse sexuality, giving money to LBTQ groups on campus which (tacitly) endorse sin through saying that consentual non unitive non procreational “”love”” trumps sin. BC is an almost completly secular institution where the only thing Catholic about BC is its belief in service for others. It is this sort of attitude which makes any constructive dialogue impossible. You have just said that all faithful Catholics are full of “bigotry and hate.” It is not “brotherly love” to accept the perverse. Professor Spiers’s Modern History I and II classes focus on African diaspora studies. They are part of the core curriculum and I recommend taking his course(s) if you are eager to learn more about the topic. willing to bet the Jews could beat you with one hand tied behind their back. You mean to tell me you are a BC alum and you are “turned off” by the letter because it is wordy? That to me sounds like a personal problem. Did you go to class? 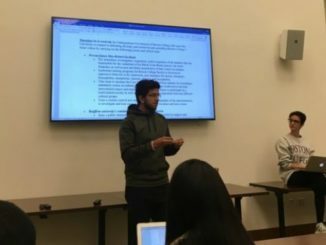 Your comments demonstrate the exact issue this letter aims to address, which is a blatant disrespect of AHANA students by refusing to address and acknowledge their legitimate concerns. Everything done at that school is from the perspective of the”seasoned professionals”. That’s the problem. These students want their perspective to be acknowledged as well, and they have every right to demand this as tuition- paying students. I strongly suggest that you humble YOURself and not respond to things you clearly know nothing about. MJ, being “wordy” is an editorial problem, not personal. You ask, “Did you go to class?” Why insult me? You referred to “that school”; it makes me think that perhaps you’re not a BC student. If so, you have no dog in this hunt. I’m pretty familiar with this particular complaint, and guess what? Not everyone complaining is a tuition-paying student. Some of them get scholarships – “a free ride.” Again, your comment is overly wordy. If you’re going to comment on editorial problems in another person’s post, you should ensure that yours is error-free. Punctuation always goes inside of quotation marks, as in “that school;” Secondly, implying that diasporas are somehow in conflict with one another is counter-productive. As a Jew and as a member of the e-board for BC Hillel, I remind you that struggles faced by one marginalized group should inspire empathy for others, not competition. Cultural histories should be celebrated, not compared. Thanks. Molly – punctuation does not always go inside quotation marks. Commas and periods go inside, semicolons and colons go outside (as you did above). I won’t give you the rules for all punctuation, but I suggest you refresh your memory on the rules. You’re right about the punctuation. Lesson learned. I have edited my previous comment to remove the error and highlight my main point. Good for you, Molly. One can never be too precise about language, since it is the source of so many misunderstandings. Before he became president he was a Jesuit. Just because he is now president of our university it does not mean he should forget his primary title as “Father” and his primary values as a Jesuit. Just because he has a more powerful title it does not give him the right to forgo the years of training in love, compassion, and faith as a Jesuit. Erik, his primary title is President. “Father” is how you would address a priest with no other title. It’s a rule for formal letters – look it up. I never said he gave up his years of training as a Jesuit. But if you wrote a letter to the Pope, would you address him as Father? If you did, you would be out of line. Ditto for the Dalai Lama. Live and learn. MCVK – First off, “emplasis,” isn’t even a word. Secondly, I’m getting the feeling that you have not lived or understood the experience of an individual who’s continuously oppressed by their society on the basis of their skin color. Furthermore, I’m one of those students that looked over this letter and guess what? I didn’t worry about grammatical errors because that’s not the point of the letter – it’s the content that matters. I’m also pretty sure that when you were a college student yourself, you didn’t receive a perfect grade on every essay you wrote for class. Moreover, I’ve read articles on The New York Times, CNN and Fox News that were poorly written but again, do you really think their messages get overlooked because of that? On another note, the reason why we’re DEMANDING these things is because it’s long been overdue. So why don’t I not see it from the viewpoint of a professor who doesn’t understand my experience as an Afro-Latino living in a society pervaded by racism. However, why don’t YOU see it from my point as an undergraduate student of color who’s tired of being marginalized and who’s tired of suffering from police brutality. And as to your comment with the Jews; do you really think we’re only focusing on Africans because it’s the African Diaspora? That’s where I know you haven’t done your homework. The African & African Diaspora Studies Program at BC doesn’t only focus on Africans from Africa. So please take a class or two and enlighten yourself before you publicly display your ignorance on the matter. Lastly, I wrote this comment on my iPhone 6. There’s bound to be grammatical errors but I’m pretty sure you got my point. Has any one of you studied the rules of grammar, style and punctuation? GS, when you referred to my egregious misspelling of emphasis (I’m so sorry), you put a comma after the word, then quotation marks. The comma was unnecessary, and any English prof would have dinged you. When you write a letter to the president of any organization, you had better be concise and to the point; he doesn’t have the time to read long, rambling, semi-coherent screeds. Making demands of the president is foolish, since he has all the power and you do not. Although I’m a U.S. citizen, I grew up in a Third World country where I was very much in the minority. Finally, if you want a diaspora program at BC, I suggest you remove the word African from the title, so others do not feel excluded. Get rid of the microscope you’re using, looking for imagined flaws, and try to see the forest in spite of the trees. I’ve tried to be respectful and answer all who wrote to me, but not one of you seems to see the much larger problems facing you, particularly when you graduate, get your first job, and think you can make DEMANDS of the “big boss.” I wish you all luck, because you’re going to need it, with a dose of humility as well. I’ve done a lot of thinking since posting my first thoughts on this letter to the Prez of BC. First of all: there have been many diasporas in the world over time. The Jewish diaspora make the African diaspora pale in comparison. The Irish diaspora may be worst of all; it is the only country today that has fewer citizens than it did in 1850 before the potato blights. Please try to be sensitive to everyone’s plight, most especially the Jews, who have been getting the shaft for millenia. Naming a department “African Diaspora” is an insult to all Chinese, Iranians, Irish, Jews, Rwandans, and Vietnamese, not to mention the Colombians and many other Latin American countries (and I’m sure I’m missing quite a few) who have escaped their national boundaries in an effort to find some type of peace. My main point is, you are not the only ones being persecuted and discriminated against. It is not you against the world. Please try to remember that when you make demands of the president of a huge university who has many problems to solve, not just your problems. Get real brother, unless you’re starving in Africa, Asia, or Latin America, BC could not care less about the concerns of non whites. Unless of course they’re rich, then they might care until they get the check handed over to them. It’s crazy to see the other comments here and see how little respect there is for the people that Jesus probably would’ve advocated for the most, the oppressed and marginalized. This is the sort of illiterate drivel we should expect from a group admitted to BC on the basis of race. I’m very proud of these students. Looking forward to see what will come of this. President/Father Leahy is fantastic at remaining utterly silent. When I was a graduate student at BC there were three undergraduate student deaths: two suicides and one accidental death. Leahy never sent a single email to the student body about any of these deaths. Rather than communicate directly, he had his underlings (e.g. AVP of student affairs) communicate to students. Not a peep from him. Later that year in Leahy’s end of the year letter to students, faculty and alum, he recalled all of the wonderful things that happened over the past year… not a single mention of any of the precious young lives that were lost that year. At the time I wrote to him asking for some acknowledgment, some words to us that indicated he was “present.” No response. I’m not the least bit surprised that he’s remained silent on the injustice of police prejudice and violence against African-Americans and how recent events might be affecting students on campus. Assuming he cares about the lives of students on campus, my only guess is that speaking out on controversial issues either isn’t in his job description, or it’s bad for fundraising. Boston College is a marvelous institution and University President Father Leahy has done a fantastic job at growing our university and helping Boston College in becoming one of the most premier institutions in the world. As a student, I have yet to hear or see one example of how the Boston College community (faculty, staff, administration, etc;) has marginalized anyone. As an LGBT student at this school I find it bizarre when I hear other students complain that the University does not do enough. The point of attending an institution is to form your own community and your own set of beliefs and as far as my experience goes Boston College has not condemned any of that. It is not the role of the University to support your cause or make political statements. If you want statements supporting your cause, then maybe you should enter politics. Demanding that an institution that has no history of marginalizing minority students come out and make a statement on matters unrelated to campus events, than you are best served looking elsewhere. I am tired of seeing our campus follow the “politically correct” trend that makes anyone who disagree either a racist or a bigot, that is no way for students to grow intellectually. If Boston College had issues with race, then of course they should adress those, but Boston College has and hopefully will remain a fair and merit based community where one achieves what one has earned. Of course racism exists and their are inherent inequities in our culture, but it is not the role of Boston College to make statements on unrelated situations that do not apply to our community. Minority students at this school are treated with nothing but love and respect, as is everyone at Boston College.